How do you lose weight without counting calories? Most adult Americans gain at least a pound or two each year. That may not sound like much on a yearly basis, but over a lifetime it is huge – if you’ll pardon the pun. Because the health consequences of weight gain are so devastating, everyone has their favorite dietary advice for keeping those extra pounds away. 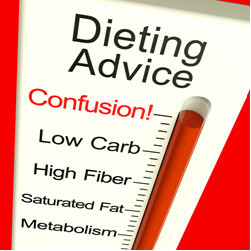 For some it is diet plans – low fat, low carb, paleo, Mediterranean – you name it. For others, it is counting calories or avoiding sugars of all kinds. The list goes on. But what if all those approaches were wrong? 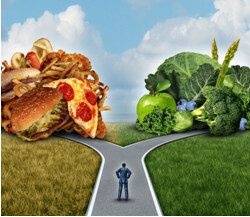 What if we could keep our weight under control solely based on the foods we eat? A recent study seems to suggest that we just might. A group of scientists from Tufts University and Harvard decided to look at how the food choices we make on a daily basis influence our weight gain or loss over time (Smith et al, AJCN 101: 1216-1224, 2015). Most studies of this kind look at what foods people are eating at the time of the study and compare that to how much they weigh. This group of scientists looked at changes that people made in their diets and correlated that with how much weight they gained or lost over time. The scientists conducting the study measured changes in food choices and changes in weight over the duration of the studies. In analyzing the data, they looked at 3 variables: choices of protein foods, total carbohydrate, and the glycemic load (GL) of the carbohydrates. Glycemic load is the effect on blood sugar of the carbohydrates in a food times the total amount of carbohydrate in that food. You can think of glycemic load as a measure of carbohydrate quality. Foods with low glycemic load have little effect on blood sugar. Foods with high glycemic load cause a major increase in blood sugar. You probably already know that is not a good thing. You probably also have a pretty good idea of which foods have a high glycemic load. For example, white bread, pastries, muffins, pancakes, white rice, chocolates, candy bars, cookies, brownies, cakes, pies, and pretzels would all be examples of foods with a high glycemic load. Fruits, whole grain foods and starchy vegetables would be examples of foods with a moderate glycemic load. Vegetables and beans would be examples of foods that generally have a low glycemic load. Lose Weight Without Counting Calories Means Foods Are More Important Than Calories? When the subjects replaced a serving of carbohydrate-rich foods with a serving of red meats, processed meats, chicken with skin or most cheeses, they gained between 0.5 to 2.3 pounds per year. 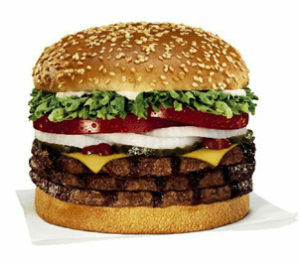 Within this category, the greatest weight gain was seen when hamburgers were substituted for carbohydrates, and the least weight gain was seen when cheese was substituted for carbohydrates. These are substitutions that pack on the pounds. When the subjects replaced a serving of carbohydrate-rich foods with a serving of milk, peanuts or eggs, there was no net change in weight. These appear to be substitutions that are good for weight maintenance. When the subjects replaced a serving of carbohydrate-rich foods with a serving of yoghurt, peanut butter, beans, walnuts, other nuts, chicken without skin, low-fat cheese or seafood, they lost between 0.5 and 1.5 pounds/year. These appear to be substitutions that are good for weight loss. When they focused on carbohydrate-rich foods, replacing one serving of high glycemic load foods with low glycemic load foods was associated with one pound of weight loss per year. Simply put, if you switch from cookies, pastries and candies to fruits and vegetables, you are likely to lose weight. No surprise here. This would seem to be a method to lose weight without counting calories. When the subjects added a serving of red meat to a diet containing carbohydrate foods with a high glycemic load, they gained an average of 2.5 pounds per year. When they added that same serving of red meat to a diet containing carbohydrate foods with a low glycemic load, they gained only around 1.5 pounds per year. Finally, glycemic load also influenced the effectiveness of protein foods associated with weight loss. For example, addition of a serving of beans to a high glycemic load diet resulted in 0.5 pound/year weight loss, but adding a serving of beans to a low glycemic load diet resulted in a 1.5 pound/year weight loss. Many people focus on fats and calories when trying to avoid weight gain. While this study is not really fat and calorie neutral (see below), it does suggest that if we focus on eating healthy foods, we don’t need to be counting every fat gram and every calorie. In other words, you can lose weight without counting calories by eating healthy foods. Can We Lose Weight Without Counting Calories? The real message is not that fat content and calories don’t count. Nor is it that calories in some foods count more than the same calories in other foods. The take home lesson from this study should be that we don’t have to focus on fat and calories. We don’t need to jump on the latest fad diet. If we focus on healthy foods, the fat and calories tend to take care of themselves. This is a new insight. Many people advocate a high protein diet for weight control or weight loss, but many of them will tell you the type of protein doesn’t matter. 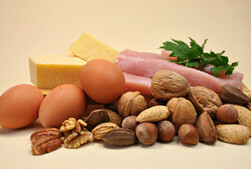 This study suggests that the type of protein foods we eat are important in determining whether we lose or gain weight. Some in the media have interpreted this study as saying that fat and calories don’t count. However, this study was not designed to be fat and calorie neutral. The real take home message from this study is that we may not need to focus so much on fat and calories. When we focus on eating healthy foods the fat and calories tend to take care of themselves. I would be the first to acknowledge that many people need strict guidelines and a well-designed diet program to lose the extra pounds that have built up over the years. However, to keep the weight off they simply need to embrace a lifestyle that includes healthy food choices and regular exercise. You can lose weight without counting calories. Very insightful! Thank you for breaking down, interpretations, and sharing the results of this study. So many diets, “lifestyle programs”, and even the smart phone nutrition tracking apps focus on caloric intake and not the quality and types of calories. This is another reminder to be mindful of what we eat! Thank you again, and also, thank you for your newsletter!